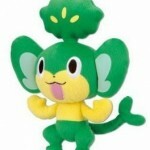 Pansage is a Grass type monkey Pokemon introduced in Generation V. In the game if you choose Tepig as your starter, Pansage is given to you at the Dream Site and useful in battle at the Striaton Gym where you earn the Trio Badge. It is one of three elemental monkey Pokemon and will evolve with exposure to a Leaf Stone. 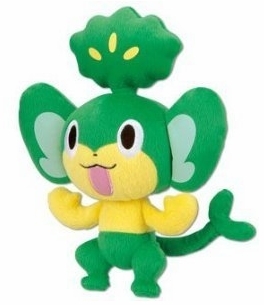 This Pansage plush is officially licensed and needs a good trainer! You can find all of your favorite Pokemon at Pokemonzone.com.